Bud Ruff, a U.S. Navy veteran, retired in 1990 after 43 years as an electrician and electrical contractor. The last 26 years he was co-owner of Bud Ruff Electric with his wife Dorothy. Since his retirement, he has been a dynamo in the world of volunteerism, especially in those areas pertaining to young people. Recent youth-oriented activities include the newly lighted Woodruff Park Baseball Field, the Pioneer Homestead program for youth at Sommer Park, the Park District Youth Baseball Advisory Committee, the Tri-County Sports Board, Bradley Chiefs Club and the Old Timers Baseball Association. Perhaps a reflection of his business expertise, Bud leads by example with seemingly tireless energy. A quiet, meticulous person, he is persistent, hard-working, and lastly, a perfectionist. Every Board or Committee needs a Bud Ruff. 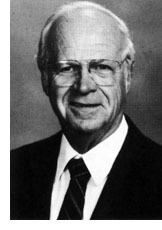 In 1970, as a member of the First English Lutheran Church Council, he helped found the Peoria Youth Boys Basketball League directed by Paul Reatherford. The league currently is celebrating its silver anniversary. 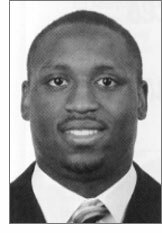 A Woodruff graduate, he has always been a supporter of the school, and its sports programs, never forgetting his Northside ties that began at Greeley Grade School. A parent of three Peoria High School graduates and Past President of its booster Club, Bud was honored by Peoria High with a lifetime athletic pass for over ten (10) years of dedicated service. This was only the second one ever issued by the school. He helped the school many times not just as an individual, but through his company as well. He is President of the Northside Planning and Development Corporation, and a Past President and current Board Member of the Northside Business Association. His Northside roots have made him a "force to be reckoned with" in the revitalization of the Northside of Peoria. In this regard, he has been a forceful community leader. Although his comm unity volunteer activities are diversified, he continues to be an avid spokesman for sports programs involving young people in our area, bringing pressure to bear whenever possible. When not involved in volunteer work, Bud and Dorothy, his wife of 45 years, try to spend time enjoying their five grandchildren.